I was only there for five days, but in that short time span, Monterey Car Week drastically altered my perception of automotive normalcy. To make things worse, I don’t think it’s ever going back to the way it was. Five days is all it took to go from “ooh, look, a new Mazda MX-5,” to “oh, just another Ferrari 360 Modena.” It was like having a gourmet chef at your beck and call for three meals a day, only to return to oatmeal and microwave burritos. Not that there’s anything wrong with oatmeal or microwave burritos, or the Mazda MX-5 for that matter. The point I’m trying to make is that Monterey Car Week is a different world to what folks like you and me consider “ordinary life.” Scratch that – MCW has left the galaxy and is zipping between dimensions – comparatively speaking, of course. You see it on the streets, in the parking lots, and at events like the Gordon McCall Motorworks Revival. Simply put, MCW is top-tier automotive bliss, and once you’ve tasted it, things will never be the same. Imagine sitting at a street corner coffee shop, sipping your favorite caffeinated beverage. In front of you is a major downtown thoroughfare jammed with cars. What do you see? A Civic trying to parallel park, a Camry idling at a stop light, some construction workers piling out of an F-150 for lunch... the usual. Thing is, if you happen to find yourself in a similar situation in downtown Monterey during Car Week, the scene looks a little different. For starters, that Civic trying to park turns into a Bentley Continental, its enormous wheels inching dangerously closer to the curb as it attempts to maneuver into the singular empty spot. Replacing the Camry is a Shelby Cobra 289, its burbling V-8 spitting and popping with an anxious right foot. The F-150 is swapped for a Rolls-Royce Phantom, while the construction workers are exchanged for well-dressed representatives of the one-percent, muttering amongst themselves about fluctuating auction prices. Suddenly, a Lamborghini Huracan comes charging up, chased by a heavily modified Nissan GT-R, both sports cars revving their high-flow exhausts with ear-splitting abandon. Simple car spotting on the street is a real show during MCW, but if you really wanna fry your automotive standards, then Gordon McCall has a solution. Every year, Mr. McCall throws a party dubbed the Motorworks Revival, kicking things off with tasty hors d’oeuvres, top-shelf drinks, and lots of expensive machinery. Hosted on the tarmac of the Monterey Jet Center, the Motorworks Revival pairs supercars with private jets, creating a lifestyle event perfectly in tune with the rest of the week’s festivities. This year was no different. Right out of the gates, an original Ford GT40 took a commanding position amongst a heard of flawless old school Shelby Mustangs. Across the red carpet, a gold-plated AMG SLS hid behind a red Ferrari Enzo, while a pair of Lykan Hypersports were parked by the bar. Then, of course, there’s all the aircraft, from modern Gulfstreams to WWII-era fighters. Other highlights included a Singer Porsche 911, the McLaren P1 GTR, and a huge collection of BMW 3.0’s. However, one of the coolest rides in attendance was the new Koenigsegg Agera XS, joined by none other than the mad scientist himself, Christian Von Koenigsegg. 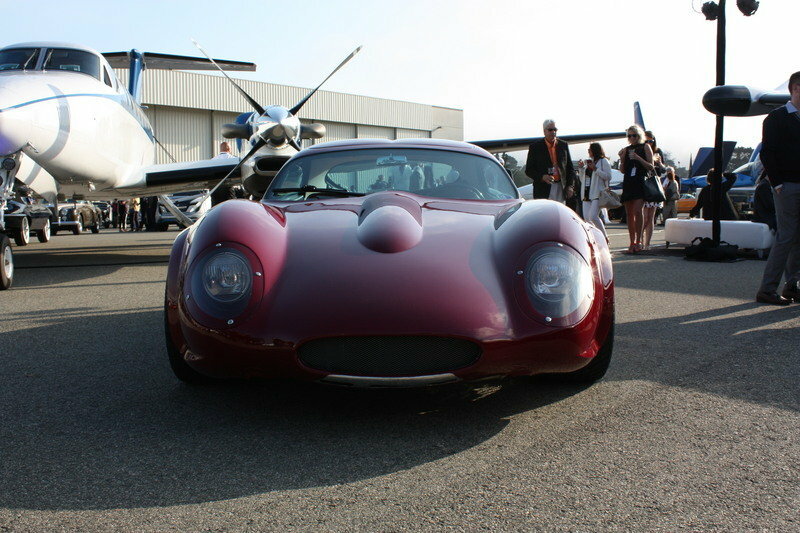 Pete Brock was also there, offering insight into the creation of the Shelby Daytona Coupe and Corvette Stingray, and so was Nicola Soprano, who showed up with his Sensuale coupe prototype. Drifting through the atmosphere was the sound of house music and the occasional engine rumbling to life, mixing evenly with the smell of the on-site chefs plying their trade. As the sun went down and the drinks began to manifest, dancers came out to spin some lights against the backdrop of flashing metal. While at odds with the glamour of the street scene and Motorworks Revival gala, I wanted to briefly mention the Soberanes fires. This year, Monterey Car Week took place less than a dozen miles north of a major wildfire. As of this writing, firefighters are still battling the blaze, and there were concerns earlier this month over whether or not the increase in traffic would stall efforts to get to and from the frontline. Thankfully, that doesn’t appear to be the case. The primary firefighting efforts are centralized south of Monterey, and traffic appeared to be flowing a little more smoothly than in years past. However, it should be noted that the fires did have some effect on the MCW events, albeit superficially. The smell of smoke was persistent throughout the week, and when the wind was blowing the right way, you could see the ash drifting down onto the perfectly polished cars. Any vehicle left outside would quickly accumulate a fine layer of soot. That said, the Soberanes fires appeared to be very much a case of “out of sight, out of mind” for the MCW attendees, which is testament to the heroic efforts of the men and women working to extinguish it.